Does my aquarium need to be cycled? Does my aquarium need to be cycled if I stuff it full of healthy plants from the beginning? The tank needs to reach a state of equilibrium where ammonia is consumed at the rate it is produced by the tank's occupants. If this can be done entirely with plants, then great. If not, a sufficient colony of nitrifying bacteria will be necessary. This is assuming the plants stay healthy. If there is decaying plant matter, then that will increase ammonia production, possibly beyond what the remaining, healthy plants can consume. Diana, Diana, Maryland Guppy and 1 others like this. Last edited by iceburg; 05-09-2016 at 06:10 PM. Reason: Re-read question and made answer more specific. To start, cycling is the process by which an ecosystem gains sustainability; the tank can remove, reuse, and recycle both nutrients and toxins on its own. Plants can quicken the cycling process but no matter what the limiting factor is beneficial bacterial growth. Waste conversion has to > or = waste production no matter what. While plants bring the waste conversion net # up a significant amount it is not the end all be all. 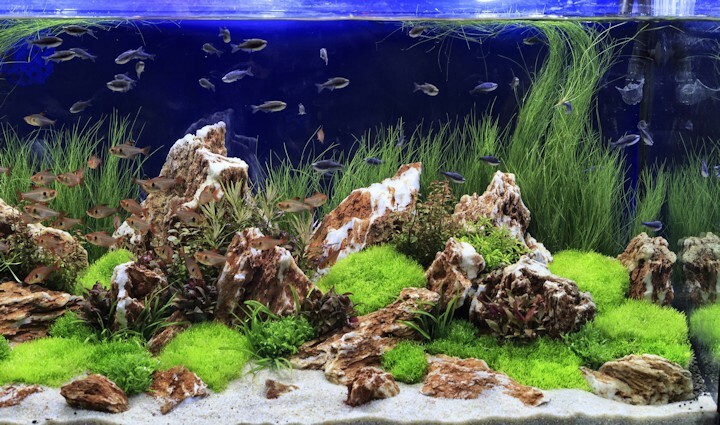 Plants, particularly the plants we are interested in this forum, are kind of finicky; you may come across melting plants, secretly diseased plants, or just plants that don't take to your tank. That can accidentally and quickly lower your waste conversion value to below waste production. Although this happens less and less as the tank becomes balanced it is a significant worry when starting with all new equipment. The bacteria we are interested in brings in a more stable source of waste conversion; it is able to fluctuate with the amount of waste production left in the water in a much more fluid manner. However, this takes a while to grow if not using a "quick start" option (API, Dr. Tim, cycled media, etc.) and in some cases may not be able to grow due to certain water parameters. This is why (if your going fish in cycle) I recommend starting with moderately to high planted tank (accounting for 10% plant loss for completely new tanks) and introducing 10-20% of your anticipated final fish stock into the tank. This will allow you to nail your water parameters, quickly introduce nutrients into your water column (either dosing or natural), and provide a waste source for beneficial bacteria to eventually grow with....all while avoiding the ever annoying "where's all the fish in your fish tank?" question. Diana, Diana, Maryland Guppy and 5 others like this. Last edited by Noxxm; 05-23-2016 at 12:05 AM. Reason: Spelling. This feels done, make it a "Sticky"
maxhrbal, maxhrbal, Noxxm and 1 others like this. While we all talk about cycling our tanks I haven't cycled one in years. Many times I get home from the society auction with a load of fish with no tanks ready. I fill up the tanks I need and add fish. It does help that I am on well water however. And it seems as if I am no the only one doing it. Many of the other members do it as well. Now the confession is the tanks are, at first, lightly stocked and water changes are consistent. "Silent cycling" with lot's of plant's work's well. maxhrbal, maxhrbal, annah and 1 others like this. Yea.. not something I'd recommend as any "general" guideline. There are a few things to consider , like the pH of your water and ones "commitment" to routine and frequent. Ammonia and nitrite will always build..for awhile.. Follows the above comment as well what is "lots"..
Cheap enough to add PRIME every other day and monitor amm/nitrites till they disappear..
At 5ml/50gal 3x week for say 4 weeks.. I've done 30 tanks just that way. Probably more. But I am on well water from the same area these fish are bred. I've done it that way since 1987. And no, I don't recommend it for everyone nor for sensitive fish. There is a guy in Miami that does 100% WC every week on his 50 tanks. He's also on well water. When my aunt and uncle had their farm during cold snaps they would run the well continuously to keep the fish warmish in the outside vats. Out of curiosity.. what is your pH? Been a long time since I bothered to check it Jeff. I don't worry about it. Probably close to 8. We are above limerock so it is going to be high. Starting a tank with plants (and plenty of them) can help in 2 ways. The plants themselves are part of the bio filter, and the nitrifying organisms can live on the plants so can be introduced to the tank in this way. Obviously the plants with the most beneficial bacteria will be plants from a tank with fish, but even in a more sterile setting these microorganisms find their way in, and will be present. Perhaps not very much in cell cultured plants. I generally do not suggest that a beginner to planted tanks try this. As suggested above, plants can be a bit finicky, and if they do not hit the ground running (should it be 'hit the tank swimming'? ), they are not going to be much of a bio filter. An experienced aquarium keeper is better able to get a successful planted tank going from the start, and is probably more aware of the littlest signs that something is going wrong before it gets out of hand. Need to start with lot's of easy fast growing plant's. A couple marimo ball's and or an Anubia plant or two ain't gonna cut it. The ammonia peak was from day 34- day 54 of the tank, and then it started to trend down, and by day 62 Ammonia was zero. The nitrite peak was short-lived, day 59-61, then it came down to zero, but nitrates were at 40. Since then I've added lots of plants, and by day 100, nitrates were coming down to zero. I would say duck weed and hornwort were the biggest factors. Fish population still light, 8 cories, one betta, and 5 amano shrimp. I became quite fanatic about watching the water parameters through the cycling process. In my 10 gallon I am growing lots of plants, and I have some inverts and some cherry shrimp. No fish, no water quality issues. I used Seachem stability during the cycling to get bacteria culture started, especially during the high Ammo (TAN) periods. and I also supplemented the substrate with a Prodibio Bacter Soil kit. Note that I speak of TAN since I was using the API Ammo test, which measures both free ammonia and ammonium, but I used the Seachem Alert, which reflects only free ammonia, and with the stability I was managing to keep that within bounds. This data series includes rH, the relative Hydrogen count, which is very exploratory on my part, based on the notion that the relative hydrogen count may play a role in healthy aquarium water, but this is purely exploratory, as I have not yet found an objective way of establishing that molecular hydrogen is indeed present, but the relationship is rH= ((ORP+205)/29.58+2*pH)). Notice also that I kept track of the UV coming online, because it presumably lowers ORP, and at least over time ORP seems to have trended lower after the UV came online. Also, my GH ran up too high, due to a problem with the water I used for my water changes, and currently it is coming down again... unfortunately the alignment of the columns does not work in the published format... so you have to visually align by focusing on the pH column.